We are fortunate in having some very special neighbours at The Sustainability Centre and we are happy to recomend them. One is local farmer George Atkinson. His family has run a 1,200-acre mixed holding, Lower Farm, since 1905. 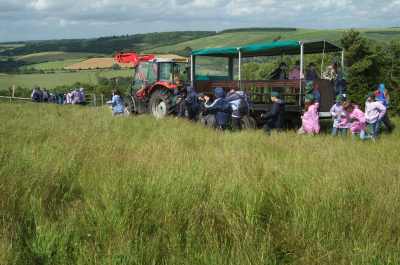 On the Farm Tour, your pupils take a ride on a tractor trailer with George and learn how he farms this area of the South Downs and cares for the local environment. Lower Farm is situated at the head of the Meon Valley in the heart of the South Downs. 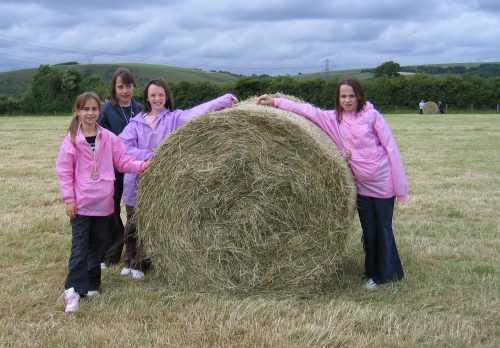 Pupils ride across country with opportunities to stop and learn about the surrounding countryside. Depending on the time of year, they may see lambs and calves, and certainly sheep, cows and horses. They will be encouraged to think about how farming affects the landscape they see around them, and to consider where their food comes from. It is an exciting experience for children aged 8+, and uses a trailer designed for taking parties on safari under cover. The trailer can accommodate 40 pupils. Our other neighbours are a small family run farm; Hyden Farm. They have been farming for five generations. Because of the way farming has changed in recent years, the way they farm and the variety of animals they breed and rear on one farm is very rare, and few working farms can offer such a varied picture of food production. 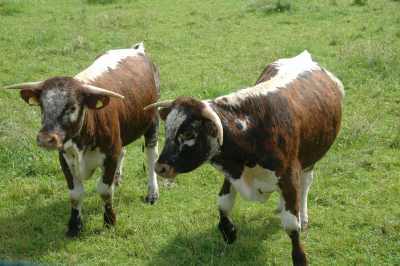 They have a passion and commitment for traditional breeds, sustainable farming practices and have exceptional welfare standards across the farm. They use no pesticides, chemicals or preservatives. Everything is born, bred and reared on their farm. 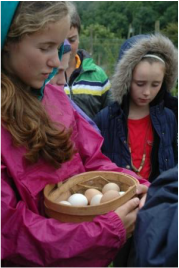 Farmer Beth will lead the children around the farm with interactive activities and see a wide range of animals. These include free range chickens, turkeys, guinea fowl, geese and pigs.. Pupils will learn about where our food comes and about organic and ethical farming.